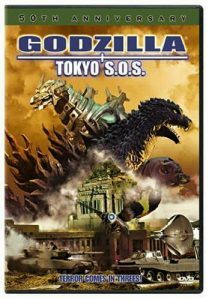 Home » Godzilla » Godzilla: Tokyo S.O.S. movie review of Godzilla: Tokyo S.O.S. Mothra’s fairies, twin ladies, appear to the Chûjô family, warning them. Mankind has violated the sanctity of life by using the skeleton of the original Godzilla in the construction of Mechagodzilla. They must return the bones to the sea, or Mothra will attack. When the humans point out that Mechagodzilla is their only defense against Godzilla, the fairies promise that Mothra will defend them. But only if they return Godzilla’s bones. Due to the imminent danger, the Japanese prime minister refuses to decommission Mechagodzilla, however. Soon enough, Godzilla attacks. Yoshito’s father and nephew signal Mothra by duplicating Mothra’s symbol from school desks at an evacuated school. Soon, a three-way brawl in effect, with Godzilla vs. Mothra and Mechagodzilla being tag-teamed, so to speak. Mothra’s egg hatches and its’ twin larvae emerge and try to come to Mothra’s defense. Mechagodzilla is down, and Yoshito comes to the rescue, trying to do what repairs he can, getting Mechagodzilla back into the battle. At one point, Mechagodzilla breaks free of human control, seizes the injured Godzilla, and flies them both to the bottom of the sea. Godzilla: Tokyo S.O.S. isn’t a bad Godzilla movie, but not exceptional, either. I rate it 2.5 stars out of 5. Mechagodzilla, the superior-armed, state-of-the-art, all-robot version of Godzilla, is undergoing repairs after his devastating battle against the world’s monsters. A pair of psychic fairies appear and warn scientists to stop rebuilding Mechagodzilla — but their warning goes unheeded. As the great robot nears completion, a series of mysterious incidents rock the world and awaken Godzilla, who unleashes a reign of terror against Tokyo. Mothra joins him and Japan’s desperate Prime Minister has no choice but to launch the unfinished Mechagodzilla against Mothra and Godzilla. But who will fight for whom? And in the end–will the survivor be monster, robot or man? Trivia for Godzilla: Tokyo S.O.S. Original title: Gojira tai Mosura tai Mekagojira: Tôkyô S.O.S. which roughly translates to Godzilla vs. Mothra vs. Mechagodzilla: Tokyo S.O.S. In this film, Hiroshi Koizumi reprises his role of Professor Shin’ichi Chûjô from the original Mothra (1961), which he starred in 40 years earlier. After the adult Mothra’s death, the eyes of her offspring change from blue to red. Following the color change, they become very active fighters against Godzilla. In the previous movie, Godzilla Against MechaGodzilla, when Mecha Godzilla went out of control, it’s eyes turned red as well. The monster whose dead body washes up on the shore was originally intended by director Masaaki Tezuka to be Anguirus. But producer Shogo Tomiyama convinced him to change it to the less popular Kamoebas to avoid fan outrage. Anguirus is a very popular monster, appearing in over half a dozen Godzilla films and coming in third place in a G-Fan magazine poll for favorite monster (behind Godzilla and Gamera). Kamoebas is a much more obscure monster, having previously appeared in only one film, Space Amoeba (1970). This was the first Godzilla film ever to be completed just in time for its preview showing at the Tokyo International Film Festival. All previous Godzilla films since Gojira VS Kingugidora (1991) were screened there around a month before their usual general release date (early-mid December), but were still busy finishing up post-production (ie. few FX shots were incomplete, wires were visible, etc. ).